A newly blooming Columbia desert parsley as seen in Upper Swale Canyon to the north of the Columbia Hills in the Columbia River Gorge..........March 22, 2009. 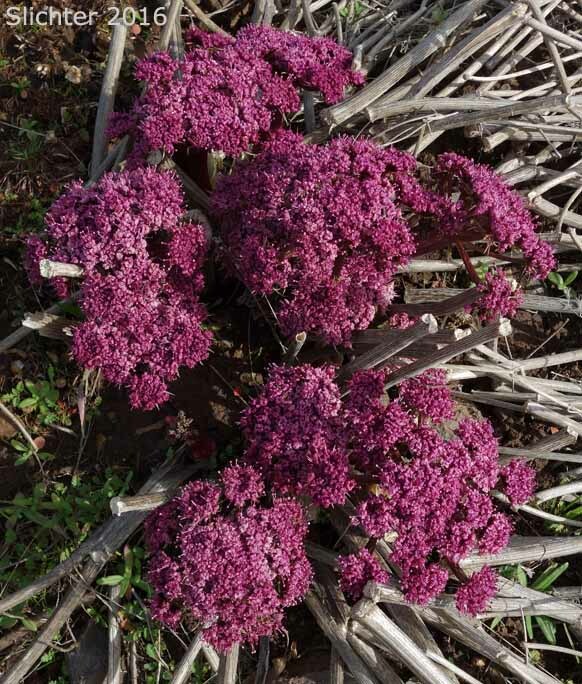 Plants typically send up flowers and then send up their glaucous foliage a week or two later. 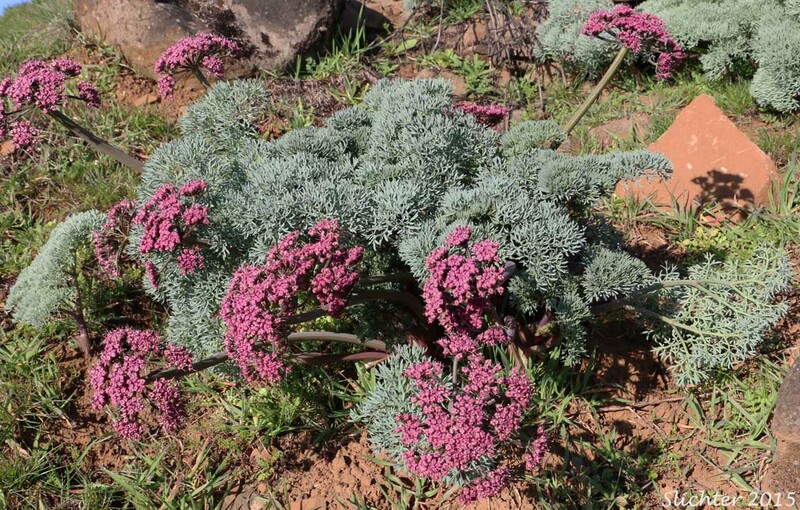 Columbia desert parsley is a very attractive perennial wildflower with one to several stout, erect stems arising from 30-60 cm high from a thick, woody taproot. 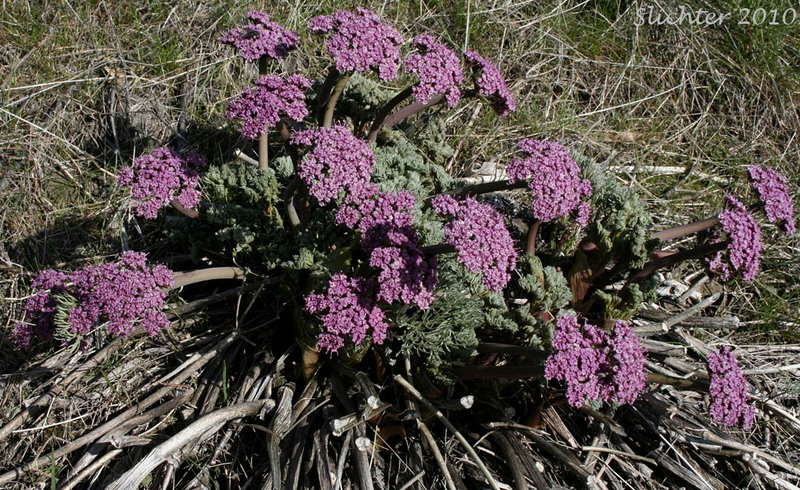 The stems are generally leafless, although a single stem leaf may be possible. 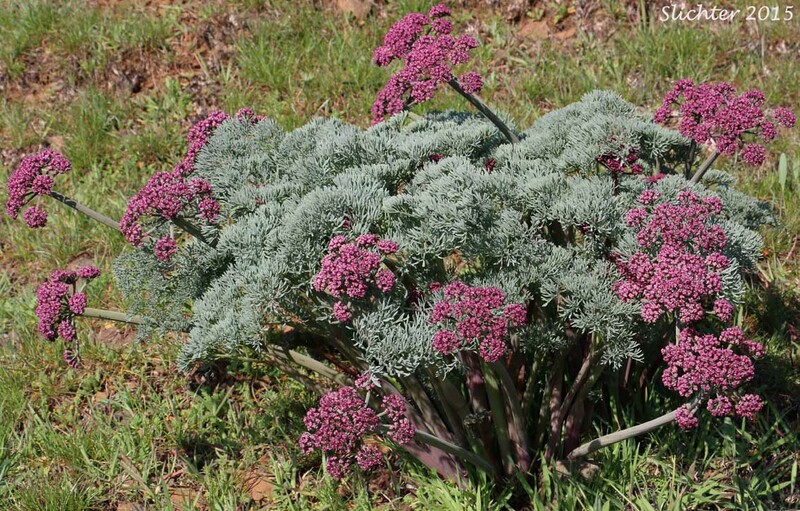 The herbage is glabrous and strongly glaucous (blue-gray). The leaves are ternate-pinnately dissected into narrow linear segments from 6-15 mm long and about 1 mm wide. Individual leaves are 15-30 cm long with strong petioles. 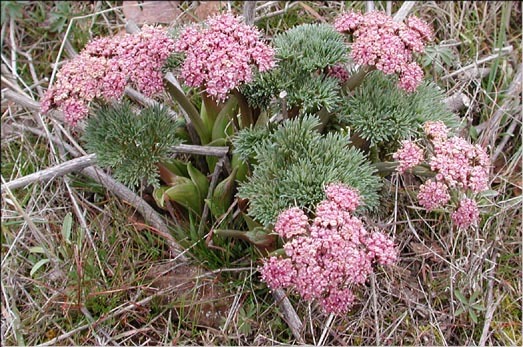 The flowering stems are hollow and 50-100 cm long. 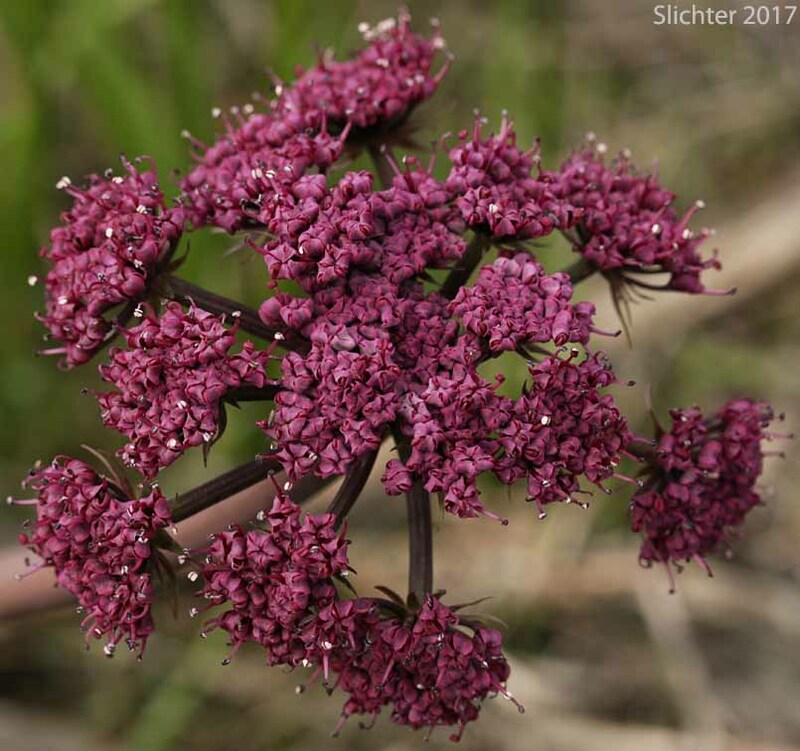 The inflorescence is an umbel with 10-20 rays, each from 10-12 cm long at maturity and generally all roughly equal in length. 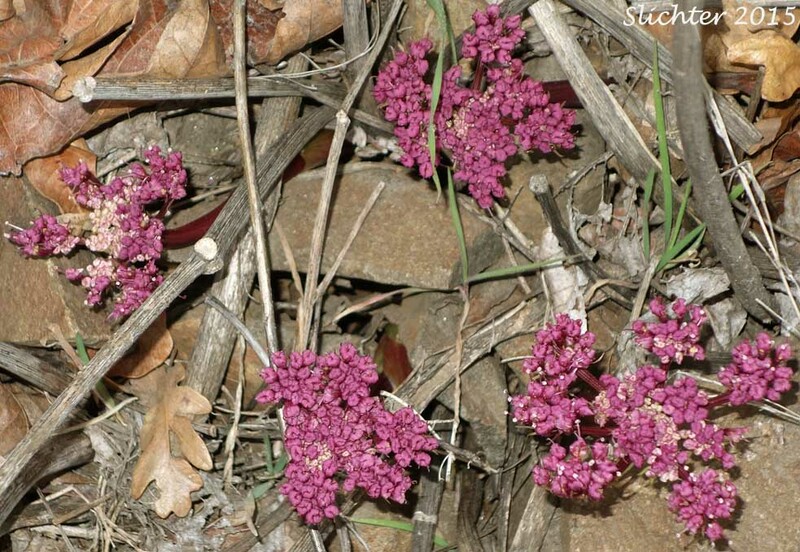 The petals are a deep reddish purple, or occasionally may be yellow. 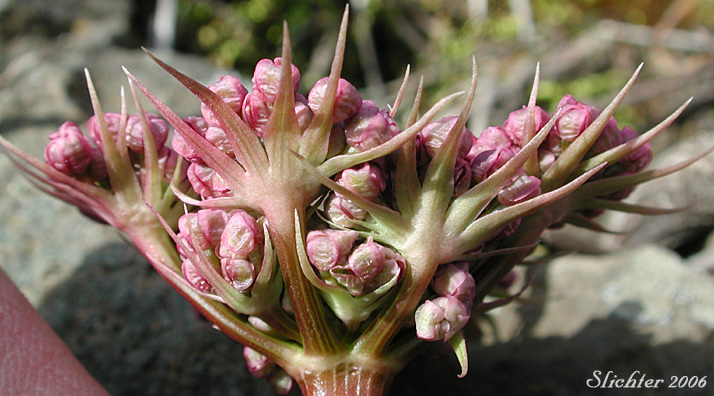 Numerous narrow bracts are found beneath each umbelet. 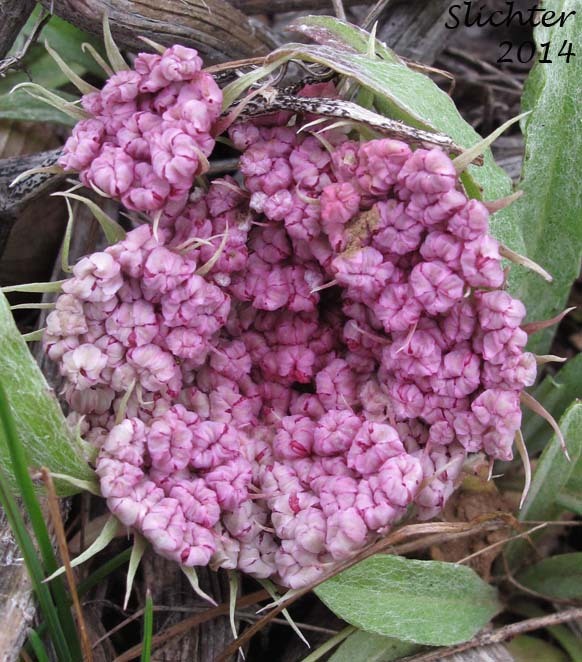 The glabrous fruits are elliptic to oblong in shape with thick wings less than half as wide as the body. 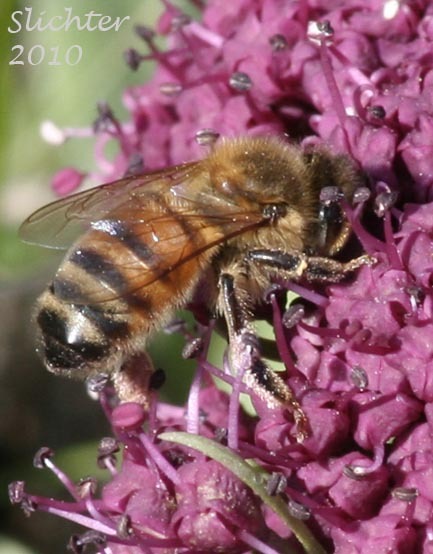 The fruits are 16-28 mm long, 8-15 mm wide, and found atop pedicels from 1-2 cm long. 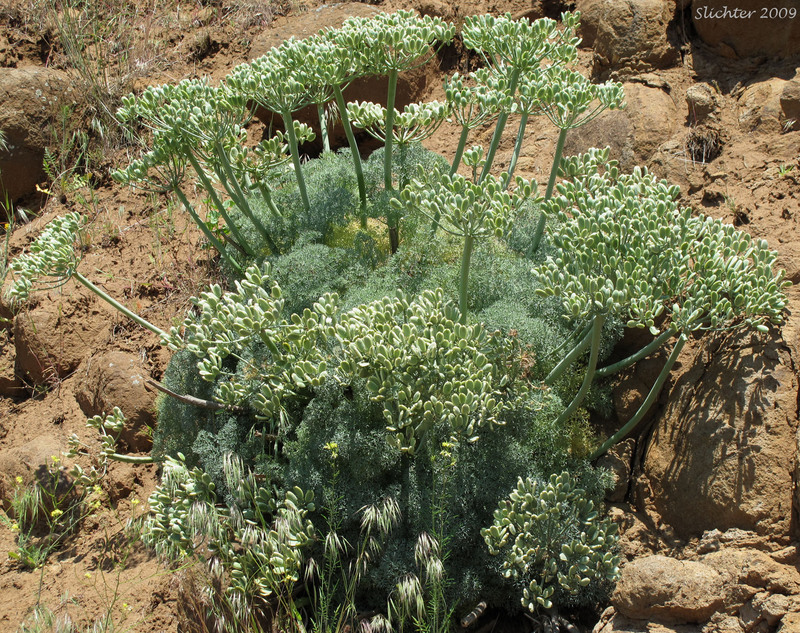 Columbia desert parsley typically begins to bloom immediately as it emerges from the ground, and then sporadically for up to 6 weeks later. 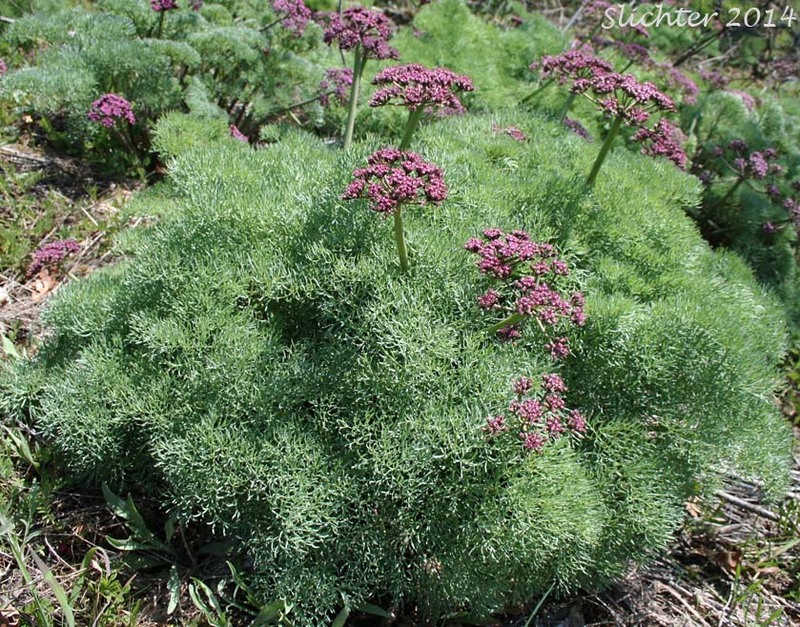 It is possible to grow Columbia desert parsley on the west side of the Cascade Mts. I have 2 plants, one of which has flowered for 3 years and is growing in size. Plants can be placed in the middle or back of a raised bed (I use a mix of composted soil and gritty sand with moderate sized rocks place around the crown.) with sufficient room for growth (plants can be up to one meter in diameter). These beds are covered with sheet plastic draped over PVC pipe for 2-3 months during the winter. The leaves can suffer from mold late in the season, especially during wet years. The photo above shows a close-up of the narrow bractlets of the involucels which are widest at their base and taper gradually to their tips. Photographed about one-half mile north of Chenoweth Creek along the old highway to the west of The Dalles, OR..........February 12, 2006. 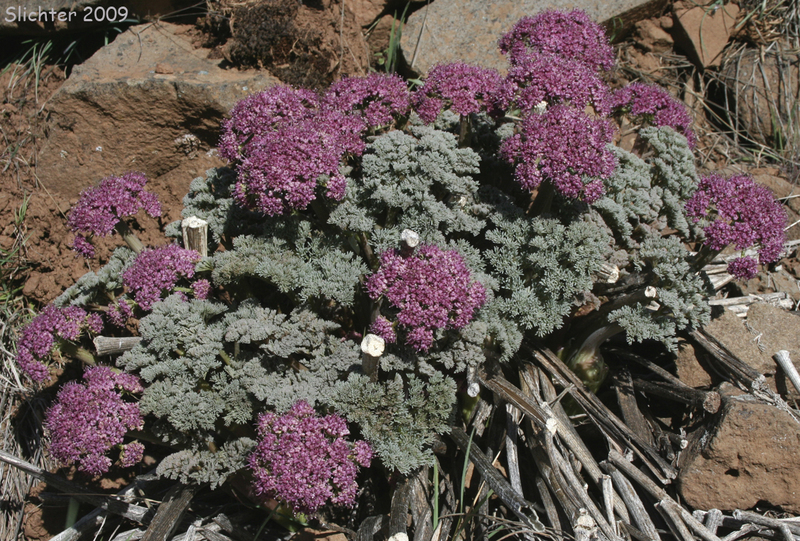 Columbia desert parsley is found on dry, often rocky slopes at low elevations. 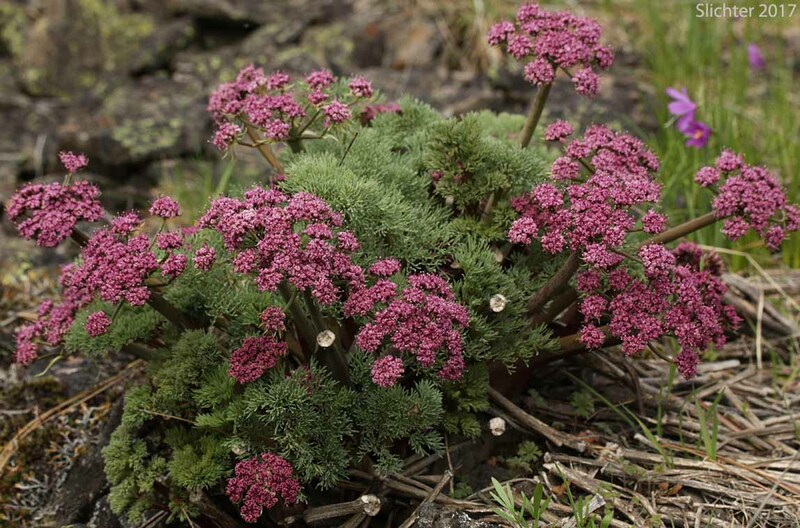 Columbia desert parsley may be found in the Columbia River Gorge in Klickitat County in Washington and Hood River and Wasco counties in Oregon, and then north to Yakima County in Washington and perhaps sporadically in the foothills of the Blue Mts. in southeastern Washington. In the Gorge it may be found between the elevations of 100'-3700' from east of the Little White Salmon River eastward to the western slopes of the Columbia Hills. A few have been observed in oak woods to the east of Stacker Butte. 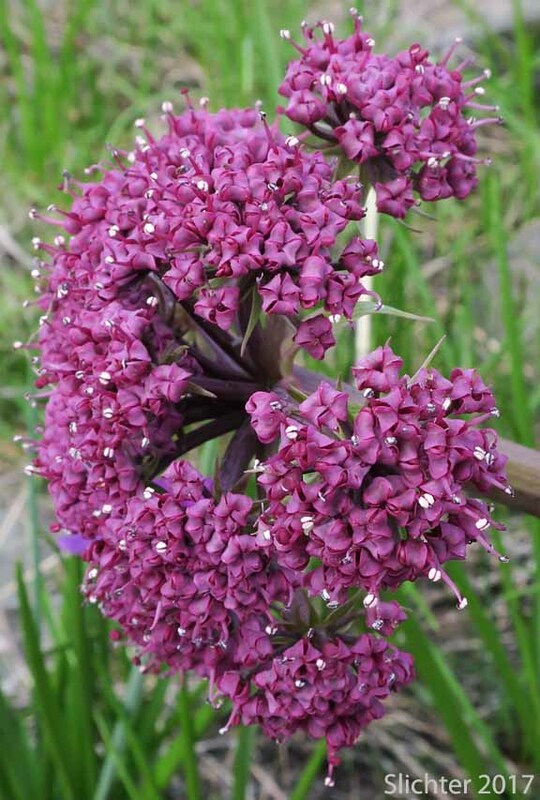 It is also found in varied locations in the lower Klickitat River drainage as well as near Chenoweth and Seven Mile Hill. Additional close-ups of columbia desert parsley beginning to bloom high in the Labyrinth in the mid-Columbia River Gorge..........February 28, 2010 (photos at left and center). 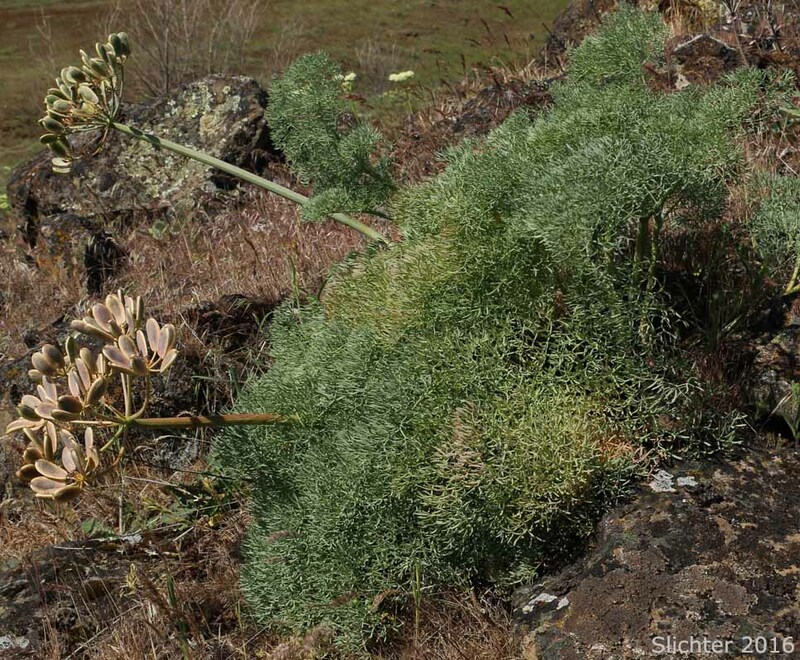 The photo at right shows a columbia desert parsley beginning to bloom on rocky slopes on USFS lands adjacent to the Wasco County Rock Quarry on Sevenmile Hill.........February 13, 2015. Mature fruits of columbia desert parsley as seen along the Mosier Plateau Trail on the east side of Mosier, OR.........October 6, 2017. Columbia desert parsley as seen (left) along the Memaloose Trail in the central Columbia River Gorge...........April 12, 2010. The photo at right shows columbia desert parsley blooming at The Dalles Discovery Center, The Dalles, OR...........April 5, 2016. 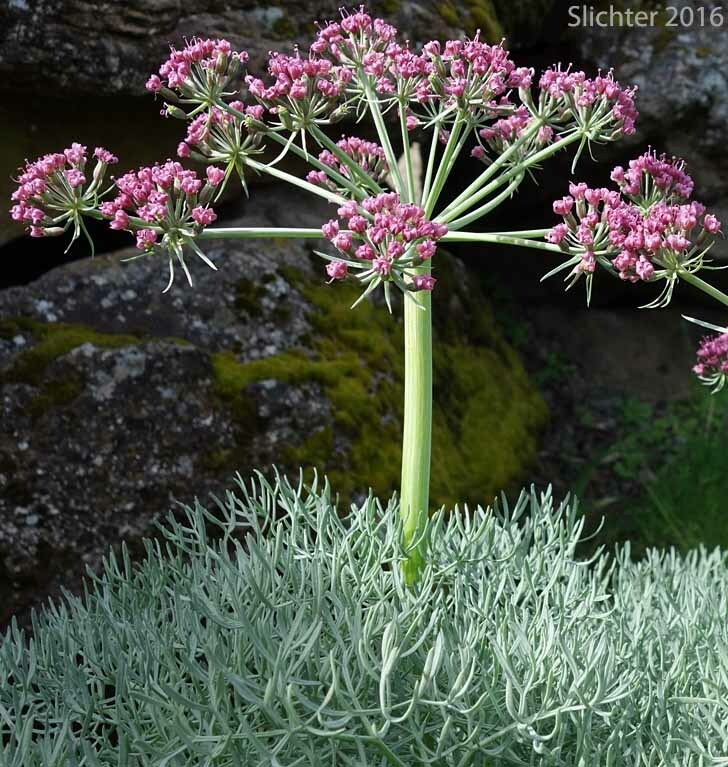 The photo above shows the newly blooming Columbia desert parsley as seen at Tom McCall Nature Preserve..........2004. 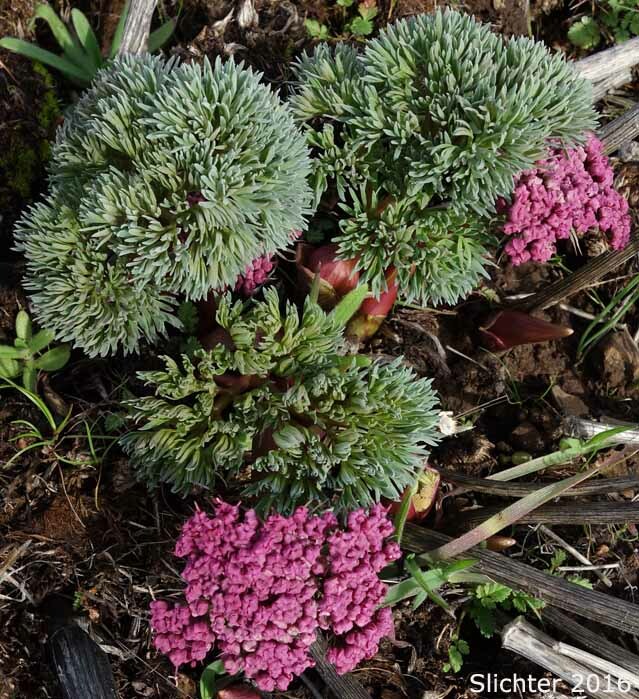 A close-up of Columbia desert parsley with its fruits nearing maturation as seen (left) on steep open slopes above the Klickitat River in the Klickitat State Wildlife Area of south-central Washington..........May 24, 2009 The photo at right shows columbia desert parsley with fruits nearing maturation at seen on open slopes just east of the Wasco County rock quarry on Sevenmile Hill..........April 23, 2016.. Examples of possible pollinators of Columbia desert parsley as seen along the Klickitat Trail about one mile north of the Fisher Hill Road trailhead, Klickitat County, WA..........February 20. 2010. 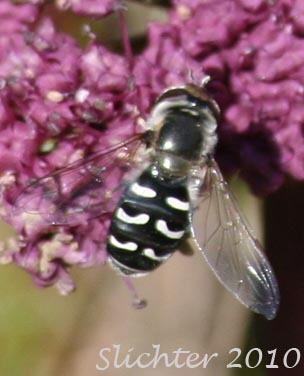 Medium-sized black flies were also seen on the flower heads at this location. 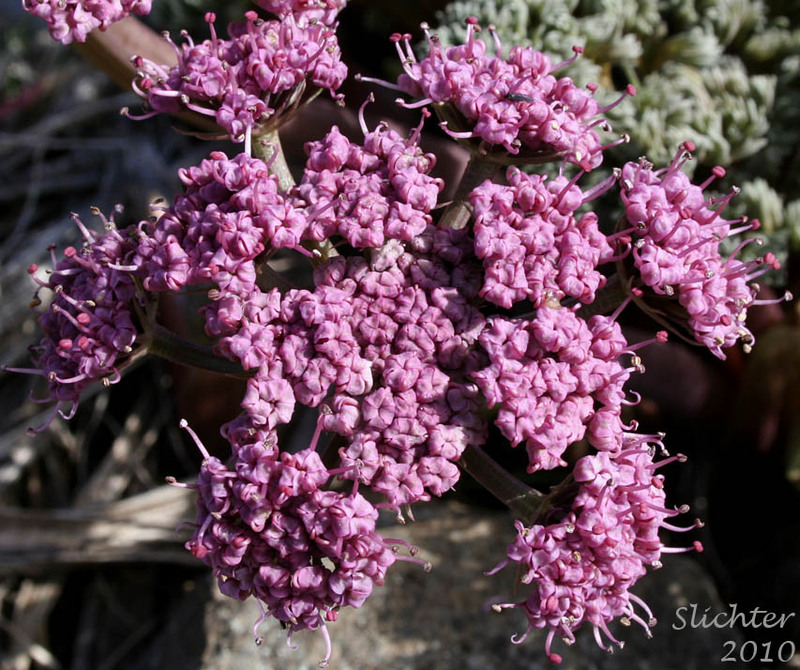 The first Columbia desert parsley to bloom in 2012 at a location along the old Highway 30 between the Chenoweth Exit and the Discovery Center. Be careful not to trespass on private lands here. Photographed on February 11, 2012. 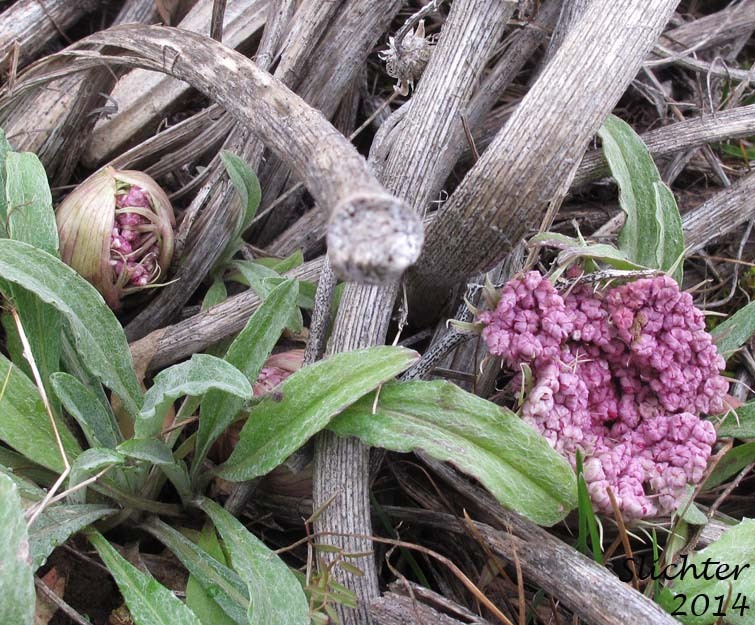 Easier plants to find were observed the same day on rocky slopes above Washington Highway 14 about 100 meters east of the Cherry Orchard parking lot. Some of the desert parsleys (which are old enough and have sufficient stored energy) such as this species will often put their first spurt of new growth into reproduction before sending up their first leaves. Note also the old dried remains of the previous years leaf and flower scape stems. A good view of the thick, long root of Columbia desert parsley as seen on the cut bank above Washington Highway SR14 just east of the Lyle Tunnels in the Columbia River Gorge................February 20, 2012. Such roots reach deep for moisture and nutrients and help anchor the plant on the constantly shifting talus slopes it is typically found on. 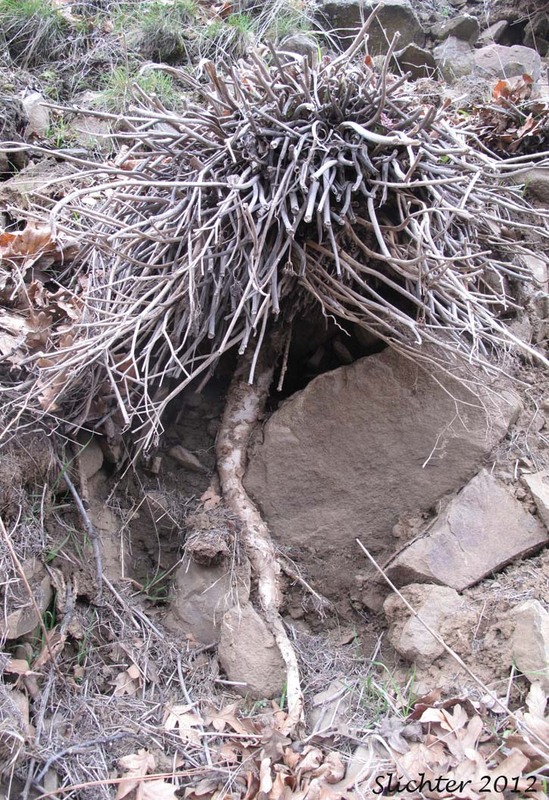 Unfortunately, this plant is probably doomed when the root is this exposed from the downhill side at a location that is occasionally bladed to clear out rock fall and sloughed off soil. 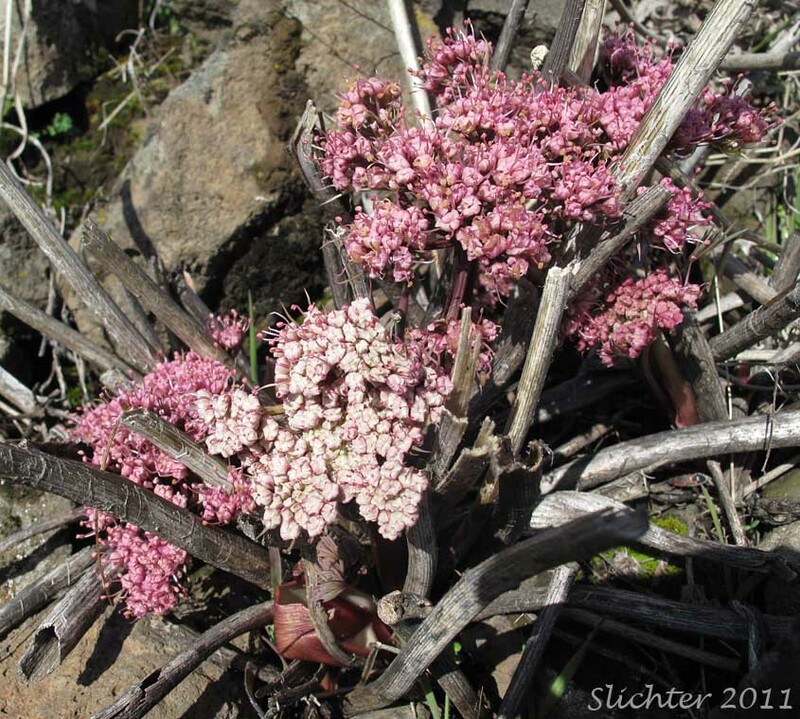 Columbia desert parsleys blooming on Marsh Hill in the Columbia River Gorge..........March 23, 2014. 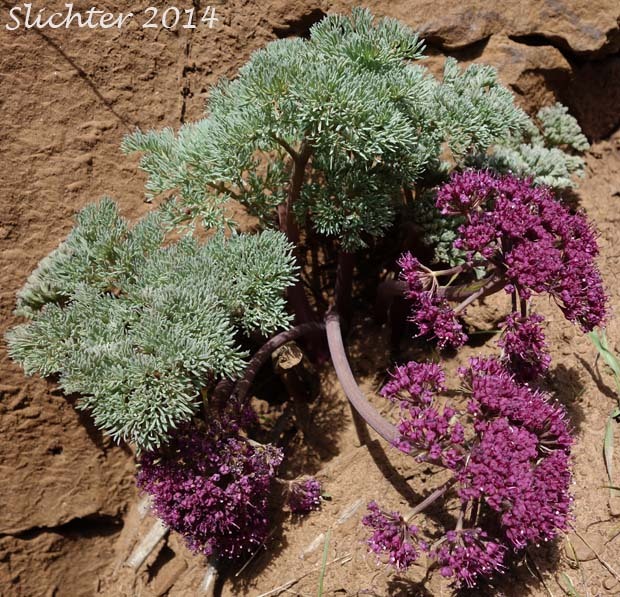 A newly blooming Columbia desert parsley as seen ( left) clinging to rocky slopes in Upper Swale Canyon to the north of the Columbia Hills in the Columbia River Gorge..........March13, 2014. 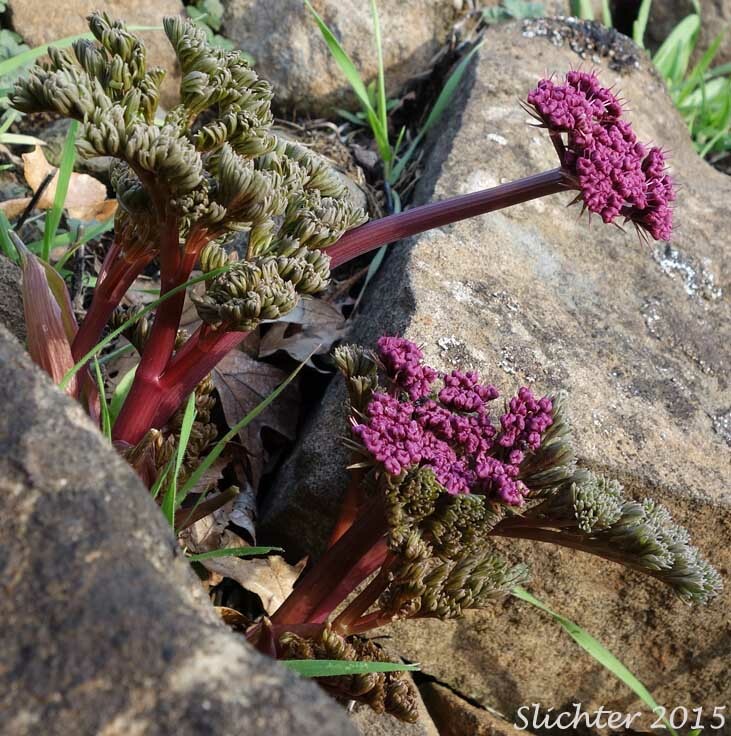 The photos at center and at right show newly emerged and blooming columbia desert parsley blooming on the south-facing slopes of USFS property on Sevenmile Hill near the Wasco County rock quarry.........February 15, 2016. The first Columbia desert parsley of 2014 beginning to bloom along the Memaloose Trail at Marsh Hill, Columbia River Gorge..........January 19, 2014. 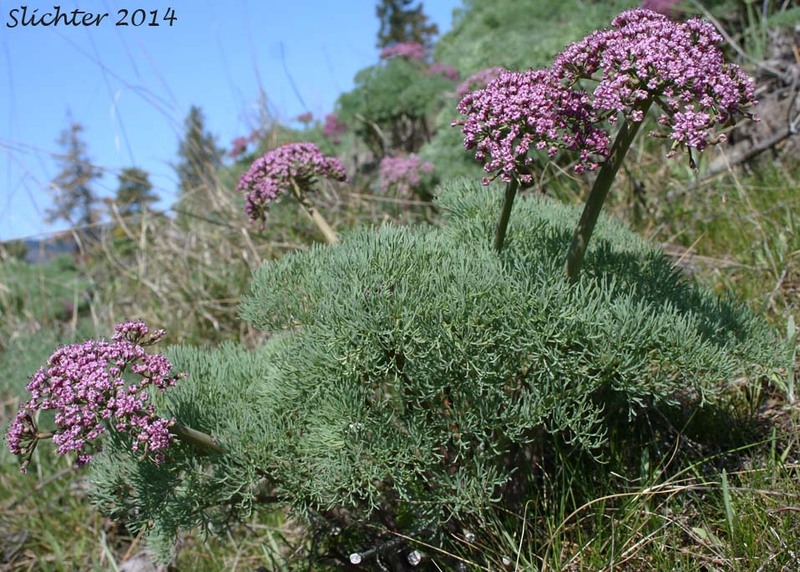 Columbia desert parsley beginning to bloom on talus slopes near the Lyle-Cherry Orchard parking area off SR 14 east of the Lyle Tunnels, Columbia River Gorge..........January 31, 2015. Columbia desert parsley blooming at Catherine Creek........March 23, 2017. 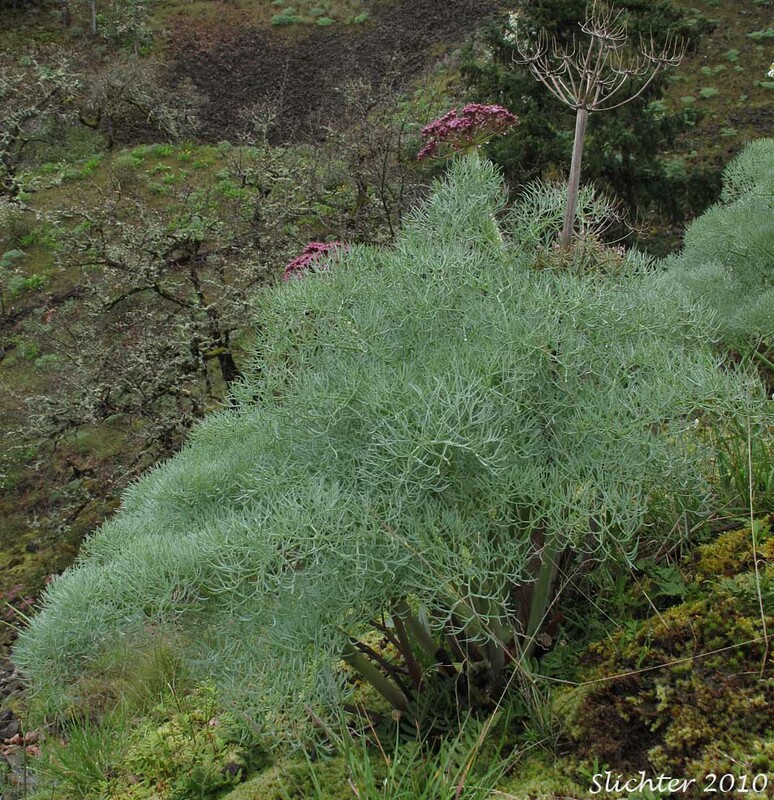 Columbia desert parsley blooming on southeast-facing slopes of Sevenmile Hill several miles northwest of The Dalles, Oregon..........March 8, 2015.